BBE has teamed up with Chicago based Still Music to bring you a slice of phenomenally rare Disco / Boogie tracks. 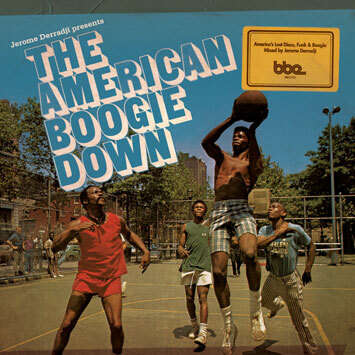 ‘The American Boogie Down' was compiled and mixed by Still Music label owner; Jerome Derradji with the talents of Detroit vocal legend Paul Randolph featured on the mix. This compilation is taken from ‘Past Due Records'. Still Music's famous disco reissue division. It includes two unreleased tracks from Chicago's Morning After and Detroit's Monofide. There is a natural synergy between BBE & Still (who have over the last four years championed house, soul, techno, afrobeat and disco sounds) and this meeting of musical minds could be the beginnings of a fruitful journey unearthing rare gems from the past as well bringing new talent to the fore. Outside of New York City, the sound of late 1970s soul music was adhered to almost begrudgingly. Up to that point, most of Middle America had been allowed to remain blissfully behind the curve, appropriating the fashions coming out of the urban cultural centers at a leisurely pace. But by the time of disco music's explosion, mass media and the major label machines were functioning effectively enough to make even the sleepiest burgs more aware. A&R extraordinaire for Still Music, Past Due and the infamous black label LFM and resident DJ at the famous Apt in New York, at Pink with the Culprits in San Francisco, at the Fi-nite Gallery in Detroit , Dj Jerome Derradji was recently signed by BBE records for the release of his first disco mix cd "The American Boogie Down" taken straight from the Past Due Records vaults. Release scheduled for late march 2008. He also has been touring the world since January 2007 to promote the release of it's "Sound Of Still Music" compilation released in March 2007 by legendary London based Slip N Slide house music label. Jerome also successfully released his first compilation cd in Japan titled "Analog Soul" in 2007. So far both these releases took DJ Jerome Derradji to London, Paris, Manchester, Liverpool, Paris, Lyon, Hamburg, Brussels, Gent, Detroit, New York, San Francisco and Chicago to play at the trendiest club and parties around. His eclectic style is similar to the music released on Still Music, Past Due and LFM: from techno to disco with a strong touch of Detroit house.